Hamburg, 30 June 2011 � Olympus has done it again, launching a new generation of head-turning, compact PEN cameras that offer SLR creativity, simple, no-nonsense controls. For people looking to express themselves with state-of-the-art technology in an easy-to-use package, the compact and cute PEN Lite (E-PL3) is ideal. Like the top-of-the-range E-P3, the Lite is packed with some of the very best imaging innovations around. For example, FAST AF, the world�s fastest* autofocus system for interchangeable cameras. There�s also in-body Image Stabilisation and combinable, one-touch Art Filters for adding creative flair to Full HD movies and stills. And then there�s the new tiltable LCD. Whether you�re a serious photographer or a snap-happy amateur, a 3-inch, tiltable display makes capturing stand-out images in awkward situations as easy as taking a regular shot. The tiltable LCD is just one of the user-friendly features that puts the PEN Lite streets ahead of any other camera of comparable size. The fact that �comparable size� means compact speaks volumes about the E-PL3. For a system camera with interchangeable lenses that delivers SLR quality, it�s remarkably small and chic � with a premium, brushed aluminium finish. Stunning pictures from a cool camera that�s as easy to use as a point-and-shoot? Absolutely. That�s what the Lite�s all about. 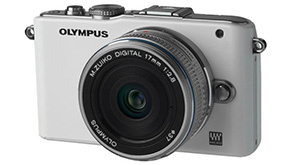 The Olympus E-PL3 is available from autumn 2011 with pricing to be confirmed. One of the things people love about PEN cameras is the way they make it easy to take high-class pictures, even if you don�t know much about photography. Thanks to some the latest high-tech innovations, the PEN Lite takes that user-friendliness to a whole new level. It�s the very first PEN with a tiltable LCD that makes seemingly impossible shots a piece of cake. By pulling out and angling the 3-inch display, you can comfortably frame and capture unusual perspectives, even with the camera at arm�s length. For example, if you need to shoot over the heads of a crowd or focus on an insect by your ankles without bending down. To make the most of excellent optics and to get the very best shots, camera settings need to be spot on. For an amateur, that�s often a challenge that ends in frustration. Not with the Lite, and Live Guide is the key. Live Guide lets you easily master the settings that make all the difference �motion and background blur, colour intensity, lighting mood and brightness. In a typical shooting situation, the Live Guide helps blur out the background to make a shot more dramatic and show off the foreground to the best effect. To achieve this, you�d normally have to adjust the depth of field using the lens or menu, but with Live Guide you just press a dial to move a bar up and down until you see the shot you want on the LCD. The Lite chooses the right settings automatically. Adjusting more permanent settings in the menu is simpler too, now that each menu choice has a pop-up window with a description of how it works. And for other menu settings that need adjusting more regularly, Olympus have fitted a row of fast-access buttons � on the top of the camera right next to the shutter release. When you purchase a PEN Lite, you can be confident you�re taking home cutting-edge technology. And that means fantastic still and movie quality. Like the other two new PEN cameras, the E-PL3 is powered by the new Olympus TruePic VI image engine. TruePic VI makes the camera faster and more responsive all-round, but the speed of the autofocus is amazing. FAST AF is the world�s fastest* autofocus system. An AF of this speed gives you every chance of capturing even the most spontaneous, fast-moving shots. And with 35 separate focus points spread over nearly the whole sensor, it�s even possible to focus on objects tucked away in the corners of the display. Thanks to AF Illuminator, low-light focussing is better than ever and new AF tracking technology ensures subjects stay sharp even when they move in and out of the frame. And all this in the blink of an eye, because Full Time AF means the AF is always on � and the main subject already in focus. The supercharged TruePic VI processor also makes it possible to record Full HD 1080i movies and capture pristine images in 12.3 Megapixel quality, even in low light. With a 60Hz frame rate, Full HD resolution and a stereo soundtrack, movie picture quality and realism has to be seen to be believed � ideally with a group of friends on a big Full HD TV. What�s more, there�s a choice of video formats. For TV playback, users can choose AVCHD, which generates a smaller file size. If they want to edit their movies on a PC first, 720p HD Motion JPEG is ideal. Whether you�re shooting movies or stills, the PEN Lite is especially designed to deliver consistently high performance � irrespective of the interchangeable lens. Unlike on other comparable cameras, Image Stabilisation is built into the body, so the camera automatically counteracts blur with any lens you attach. Among the most advanced automatic aids on the Lite are the creative Art Filters and new Art Filter Bracketing. All six filters can be applied on-camera to both HD movies and stills and some filters can even be combined �to startling effect. Using Art Filter Bracketing, you can experiment with different looks by simultaneously applying different filters to one and the same shot. The Art Filters are Pop Art, Soft Focus, Grainy Film, Pinhole, Diorama and Dramatic Tone and at the touch of a button these can be combined with up to five additional Art Filter Effects, including the new Starlight or White Edge. As soon as photos are ready, you can play them back on the LCD as a slideshow � or on a TV via the HDMI interface. By any standards, the Lite is a striking camera. Available in black, white, silver or red, the brushed metal casing and refined design details give it an unmistakeably contemporary and premium style. Not to mention its compact dimensions. For a system camera that offers SLR-quality, these are even more remarkable than the overall look. The Lite is compatible with a growing family of high-grade Olympus lenses and accessories. It comes supplied with the re-sculpted M.ZUIKO DIGITAL 14-42mm (28-84mm**) 1:3.5-5.6 II R, just one of 20 dedicated Micro Four Thirds lenses available for PEN cameras. The supplied lens is specially designed for near-silent operation so you can shoot HD movies in stereo without the annoying background whir. For outstanding still portraits and movies with beautiful background blurring, the new M.ZUIKO DIGITAL 45mm 1:1.8 (90mm**) portrait lens is the lens of choice. Stylish accessories include the FL-300R external flash in silver with the wireless flexibility and the affordable and tiltable new Electronic Viewfinder with a 100% viewing angle and 920,000 dot resolution. Attached via Accessory Port 2, it�s excellent for shooting in bright sunshine or with a telephoto lens.